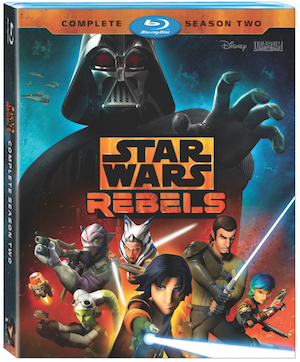 Star Wars Rebels: Complete Season Two delivers all 22 action-packed episodes of the hit CG animated series’ second season, plus exclusive, never-before-seen bonus material on DVD and even more exclusive footage on Blu-ray! Available August 30, this thrilling continuation of the Star Wars Rebels saga depicts the continued efforts of the crew of the starship Ghost to defeat the evil Empire. · Connecting the Galaxy: Rebels Season Two – Uncover hidden references, easter eggs and connections to the Star Warsuniverse found throughout the season. In addition to all the episodes of season 2, this Blu-ray set also gives you an interview with the producer and hints of where to find the Easter eggs. My teenage son loved the second series just as much as the first, and he is hoping they keep this one going a lot longer than Clone Wars. The animation is great and the story-line keeps you on the edge of your seat. He can't wait to see where season three takes things. Be sure to grab a copy for yourself today. It's available now in store national or online at Amazon.